Recently I started a Language class at the Alemania Deutchschule. While the course is quite reasonably priced at 580CHF for 4 weeks of intensive beginners classes, I was not prepared for the additional charge of 70CHF for the "materials". Assuming the materials were books I decided to do some of my own research and try and source some cheap or second hand books from the internet before the class started. as it was Sunday and I did not even specifically know what books I should be buying. As a result I ended up attending the first day of class empty handed and was given a book, cheap ugly school bag with "alemania" written on it and a pencil. Since I then knew exactly what book I needed I later that day went to the Orell Fussli on Fusslistrasse 4, this is the biggest bookshop in Zurich and has 4 floors of books. Armed with a photograph the cover of the book I found it for 21.90CHF there. A massive saving of 48.10 CHF. Then when I went to pay on day 2 I said I had bought my own book and returned the brand new one I had just bought along with the other "materials", the receptionist really didn't give me any problems about this, and I only paid 580CHF for the classes. The "materials" cost quoted on my invoice was 70CHF, which I find ridiculous consideringthat the book is 21.90 CHF and the only other materials I received during 3 weeks are a pencil, a really ugly cheap school bag (which I returned) and 10 photo copied pages. 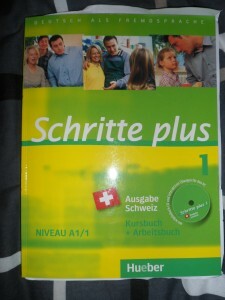 This book (A1/1) is used until half way through the second month of classes, when at this point the school will once again try to charge 60CHF for the next level book (A1/2) which is also just 21.90CHF . I would recommend that anybody doing any German classes at any school here in Zurich purchase their own books, especially if they are not included in the price of the classes. Make sure to tell the person that you book the class with that you intend to buy your own book and would like to know the exact name of the book you will be using. Zurich is already so over priced that you should not let yourself be massively over charged because you were to lazy to buy your own books.